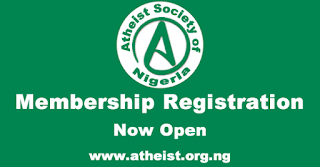 Sequel to the successful registration of Atheist Society of Nigeria with the Corporate Affairs Commission and subsequent affiliation to Atheist Alliance International, ASN has today announced the opening of it's membership registration portal. Membership is open to anyone that supports the vision and mission of ASN and is committed to upholding it's standards. This will formally give a membership status backed by law to the yearning atheists, secularists, freethinkers, humanists etc who have been looking for a platform where they can organise and pursue their common goals. The registration fee is N5,000 for regular membership and N3,000 for Student membership (students are required to scan and send a valid ID after payment before their registration can be completed). Err, UI students do not have a valid ID card as of now. Hello Joshua, a simple proof of studentship can suffice. What do i stand to gain after i join the community?